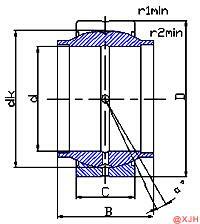 Spherical Plain Bearing The GE.HO 2RS Series is a very simple bearing. It is mainly used in engineering hydraulic cylinders, forging machine tools, engineering machinery, automation equipment, automotive shock absorbers and hydraulic machinery. The joint bearing can not only tilt within a certain angle range, but also work normally when the bearing shaft is not concentric with the shaft hole. In order to prevent sliding or creeping between the inner ring and the shaft, the inner ring and the shaft should preferably adopt an interference fit. If it is convenient to assemble or disassemble or because of the use of a floating bearing, the surface of the journal must be hardened. When using an interference fit, the effect of the interference on the radial clearance should be considered. For applications where a large interference must be used, a Spherical Plain Bearing GE.HO 2RS Series with an original clearance greater than the basic group clearance should be used.